Turn the key clockwise to lock and counterclockwise to unlock. 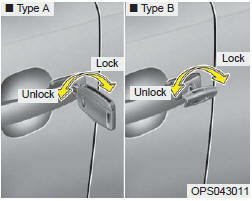 From the driver's door - turn the key to the left once to unlock the door and once more within 4 seconds to unlock all doors. (for normal key). 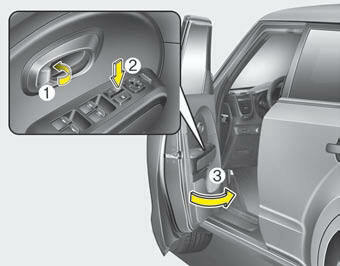 - turn the key to the left once to unlock the driver's door. (for folding key, smart key. If you don’t close the door securely, the door may open again. Be careful that someone’s body and hands are not trapped when closing the door.